Apparently there are prophets among us. I wrote an article a few days ago detailing how behind the times Zelda.com is in terms of informing Zelda fans of current events related to the series, and last night, almost as if in response, Nintendo finally updated the Zelda.com homepage to include Ocarina of Time 3D. 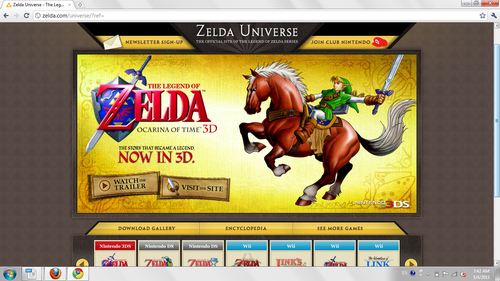 The Ocarina page at Nintendo.com has long had a redirect from the URL Zelda.com/Ocarina3D, but now the site functions fully on the series’ main domain. No longer do we have to look at that old teaser image for Spirit Tracks! With E3 right around the corner, we’re probably going to hear something about Nintendo’s plans for Zelda’s 25th anniversary year pretty soon. Whether this means some kind of special limited bundle for Ocarina of Time 3D and/or Skyward Sword or something else is beyond me (although, personally, I’d put some money on that possibility), but whatever it is, I’m curious to see how fast the details of the promotion will make it onto the Zelda series homepage. I’d be willing to bet that, whatever the case, we’ll provide the best coverage of anything Zelda-related to come out of the E3 press conference, whether we’re talking about Nintendo’s official site or any of our fellow fan ventures. Consider that a challenge!